MILFORD: On Thursday January 31, 2019 this gentle, kind, and caring soul was tragically lost far too soon to a devastating illness. 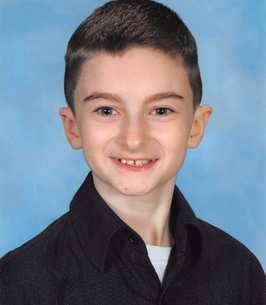 Aaron Zenus was born on May 19, 2006 in Worcester, MA. He lived in Milford and was a 7th grade student at the Stacy Middle School. Aaron loved to volunteer his time in support of the local Special Olympics program in Milford, played annually in Milford Youth sports including Little League Baseball, Biddy Basketball, and recently took on a Ninja Fit class that he loved dearly. He will be remembered for his unselfishness and putting others first, for his playful spirit and the love of his family. Sharing these gifts for all of his 12 years are the legacy he leaves for all those who loved him. Aaron leaves his loving parents Danielle (Dano) and Joseph Zenus, Jr., his adoring brother Jaxon, his maternal great grandmother Rachel Candell of Upton, his paternal great grandmother Claire Dano of Worcester, grandparents Joseph and Donna Zenus Sr., of Hopedale, Wayne and Sandra Dano of Princeton , his aunt Melinda Kadra and her husband Chris of Milford, uncle Marc Zenus of Hopedale, aunt Laura Tupper and her husband Barry of Holden, uncle Robert Creamer and his wife Catherine of Durham ME and many other close relatives and friends. He was predeceased by his grandmother Rose Dano and uncle Stephen Dano. His Funeral Mass will be celebrated Wednesday, February 6th at 10:00am at Sacred Heart of Jesus Church on 5 E. Main St. Milford, MA 01757. All are welcome to gather with Aaron’s family for visitation on Tuesday February 5th from 4pm to 8pm at Roney Funeral Home 152 Worcester St. N. Grafton, MA 01536. All those attending the Funeral Mass please go directly to the church. He will then be laid to rest at Hopedale Village Cemetery, Hopedale MA. In lieu of flowers, donations can be made in Aaron’s memory to the Friends of Milford Area Special Athletes (FOMASA) PO Box 81 Hopedale, MA 01747.